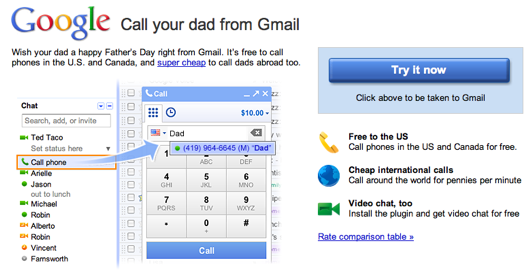 Google launched Gmail Calling last August as a simple way for email client users to make free calls within their browser. Dialing a phone number works just like a normal phone. Just click “Call phone” at the top of your chat list and dial a number or enter a contact’s name. And the quality is pretty good and calls are free thanks to Google extending the offer of free calls in the U.S. and Canada through December. While Google did create a special Doodle and tribute page for Mother’s Day this year, it did not promote one of Google’s products.